$1079$10 and 79 cents$1.35 / oz. 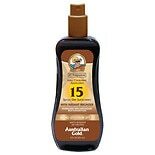 You can get a tan while protecting your skin by using bronzer spray. Depending on the level or shade of tan you'd like, you can choose from bronzer sunscreen with SPFs that range from 4 to 30. Most bronzer sprays can work all day to prevent sunburn while offering an instant bronze. Lay out by the pool or beach with your spray from Australian Gold by your side. In addition to bronzer sprays that protect and hydrate your skin throughout the day, there are other ways to give your skin that golden glow. Many options don't even require time spent in the sun. Look for bronzers here at Walgreens.com that include different types of cosmetics such as blush and loose powder. Many of these bronzer powders are made with several shades, so that you can blend it appropriately to the shade you want. 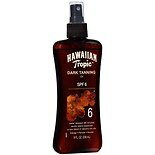 There are also self-tanning lotions and sprays that you can use without even going outside. 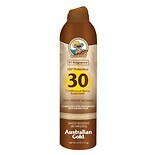 If you need stronger sun protection for long days outside, browse our selection of sunscreen products. There are many lotions, creams and sprays with SPFs of up to 100. You can use oil-free sunscreen lotion on your face or all over your body for complete coverage. For the little ones, there are babies' sun care products as well as kids sunscreens that are gentle on delicate skin.